Students in grade 7 attend computer class for 41 minutes three times per week. An additional STEAM class provides students the opportunity to explore Science, Technology, Engineering, and Math using hands-on materials. The focus of the class will be the Engineering Design Process. Students will use the coding skills that they have acquired throughout the years of computer class to create and program their own games using their knowledge of LittleBits and their imagination. Students will also participate in a makerspace activity in which they will design and create an input device for the computer using a Makey Makey invention kit. Following the Learn by Doing concept, students will build circuits as they learn about electricity and electronics with Snap Circuits. Seventh-grade students continue to use the file management skills that they have learned in the previous years. Files and folders are saved in their home directories on the server and on their Google drive. Students will delve into the issues of computer device hardware and practice analyzing specs to choose a computing device that meets their individual needs. Word-processing skills are used throughout the year as students complete assignments in computer class for their subject area teachers. Desktop publishing skills are put into practice as students learn graphic design concepts in conjunction with the elements of art that were learned in art class. Students continue to refine internet search techniques as they research using the internet. Students use the internet in computer class to find credible sources for research topics for their subject area classes. Use of the EBSCO research database allows students to find periodicals for this purpose. Internet safety issues are discussed in depth as well as cyberbullying issues. 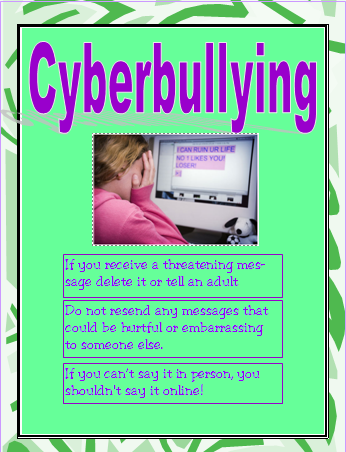 Students are encouraged to be "upstanders", not bystanders whenever they encounter a cyberbully. Acceptable Use of Network resources is also covered.